(NewsUSA) - Scuba diving can be an exotic and enriching activity, but for many, it can also be a therapeutic one. The weightlessness of a water environment allows individuals with a range of injuries or disabilities to exercise, relax, have fun, and gain confidence. Children and adults with challenges including traumatic brain injuries, amputation, spinal cord injuries, cerebral palsy, and blindness can enjoy the physical and psychological benefits of scuba diving. Diveheart, a nonprofit organization founded in 2001, trains thousands of volunteers and works with injured and disabled individuals across the world, in areas including the United States, Mexico,UK, Malaysia, Israel, Philippines and the Caribbean. As Darrell Young, a Vietnam veteran who is paraplegic as the result of a spinal cord injury, explains in a testimonial on the Diveheart website, "Diving gives me a high expectancy of myself. It gives me a goal to accomplish knowing that when it comes to the finish line it doesn't matter how I finish my dive, but the feeling of strength I gain from diving," he says. Diveheart relies on volunteers and donations to help provide adaptive diving and scuba therapy experiences at no cost to the participants. Most of the initial training and first diving experiences occur in school or community pools. Participants don't even need to know how to swim to benefit from therapeutic scuba diving, and the learning curve is almost immediate, according to Diveheart's website details. Diveheart works to spread the word that diving is a real option with many benefits for the individuals affected with injuries and for the volunteers who get involved as "dive buddies." The basic experience of being in the water with the support of a trained "dive buddy" can relieve pain, improve focus, and bring joy, according to Diveheart participants. Diveheart also provides adaptive dive training for those who want to take the next step and become adaptive divers or dive buddies to help others. 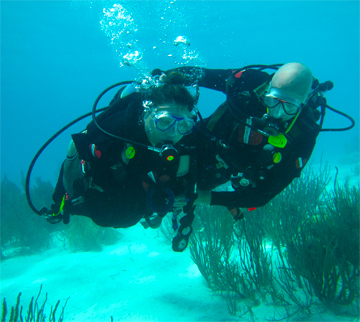 Most Diveheart participants are eager for destination scuba-diving adventures once individuals are trained and comfortable with the scuba experience. Diveheart offers opportunities for fundraising and also works to find grants for those who struggle with the cost of a dive getaway. In addition, Diveheart works with the science and medical communities to provide data and research opportunities on the benefits of therapeutic scuba diving for a range of medical conditions. For more information on participating, volunteering, or donating, visit diveheart.org.